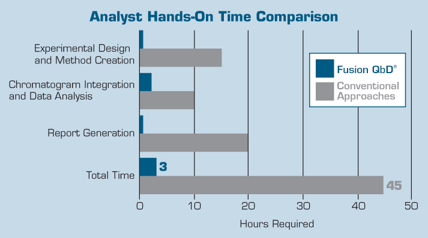 Fusion QbD HPLC Method Development software extends the realm of Design of Experiments (DOE) beyond that of the statistician to that of the chromatographer. 100% aligned with Quality by Design principles and regulatory guidelines, Fusion QbD is the premier HPLC Method Development software platform. Fusion QbD can also be applied to difficult sample matrix such as biologicals and other large molecules where classical baseline resolution is not achieved. Integration with your chromatography data system (CDS) turns your HPLC into a rapid method development machine, with your defined experimental region translated directly into the CDS by the automated creation of instrument methods and ready to run sequences. The HPLC method development software supports rapid multi-column and multi-solvent screening together with dynamic preparation of aqueous solutions (e.g. for pH screening) for maximum instrument utilization and efficiency. Contact us for more information or to arrange a demonstration. Using Fusion for LC method development is like putting on glasses you never knew you needed. Our use of Fusion QbD has moved from “Proof of Concept” to “Supporting Global Methods”. Our latest development was for a personal care beauty product, and the resulting method proved to be much more robust and simple to implement than the previous method. The product(s) impacted by this method represent hundreds of millions of USD in net sales, and we now have different manufacturing plants and innovation centres running the method around the world. The new method is 20% faster, but what is really imortant is that we have a method we know is never likely to give us problems, and we extract much more value from a trouble-free method. Tepnel Pharma Services have invested in Fusion QbD software which in conjunction with Waters® Empower™ and H-Class UPLC Systems provides an integrated solution for robust method development and optimisation, reducing turnaround times from start to finish by ca 30-50% depending on the analytical complexity required. Since we started using Fusion QbD in our R&D lab, we spend much less time developing new analytical (LC) methods. Also, the methods are much more robust and reliable than before, since Fusion QbD provides the insight on knowledge space and design space, suggesting the most suitable parameters for the method. The first step in Design of Experimentation is to define the Experimental Region. This consists of the parameters you wish to study and the ranges over which you which to study them. Fusion QbD utilises a simple template containing the potential chromatographic study parameters. Different templates exist for different chromatographic techniques and stage of HPLC method development. The templates support both column and solvent switching valves allowing for automated Column Solvent Screening studies to determine the best chemistry to take forward to optimization. This ensures maximum utilization of your HPLC while unattended. Where a quaternary pump is used, Fusion QbD can automatically prepare different mobile phases. For example aqueous solutions of different pH or Buffer Strength. This reduces the time required to set up an experiment as the analyst only need prepare a stock solution(s) rather than multiple aqueous phases. Fusion QbD automatically constructs the most efficient experimental design, while maintaining statistical defensibility and the resolution power required for proper method modelling. This removes the barrier that exists between chromatographers and pure statistical software applications (JMP or Minitab for example), where a high level of statistical knowledge is required if critical errors are to be avoided. A Quality by Design approach requires that predictions are based on sound data. This is why we gather data from throughout your Experimental Region and utilise automation to generate real data sets from your HPLC overnight. Fusion QbD uses a fully validated, GMP compliant, file-less data exchange to integrate with your chromatography data system. This integration allows the experimental design to be translated into a ready to run sequence(s) containing the experimental methods. These are ordered to maximise column stability and minimise equilibrium times. Performing the experiments and processing chromatograms remains the role of your data system. Fusion QbD’s patented “Trend Response” removes the need to track peaks and in so doing the problems traditionally associated with peak tracking (co-elution and peak exchange). In effect it models co-elution, greatly reducing chromatogram processing time while improving the integrity of data sets. Chromatogram results are automatically imported from completed sequences in a fully audited process. This ensures each data point is traceable to its source chromatogram within the data system. Note. Any peak property may be imported and modelled. This is necessary when working with large molecules (e.g. peak height to valley ratios) or non-resolved samples (e.g. peak purity). Automated data analysis provides a full suite of statistical reports that underpin the models’ adequacy. These include error analysis, residual tables and plots, and pareto ranking reports. Effective visualization of relationships between experimental parameters (critical process parameters) and results (critical quality attributes) is achieved via effects plots, contour plots and response surfaces. These promote knowledge and understanding. The “Best Answer Search” feature, allows for the method performance goals to be entered and a search of the knowledge space initiated for the methods that meet or exceed these goals. However, no HPLC Method Development software is complete without proper consideration of Robustness. Fusion QbD includes the patented Robustness Simulator which allows the calculation of Process Capability metrics (Cp, Cpk, Cpm, and Cpkm) using Monte Carlo Simulation. This allows for optimisation of the HPLC Method for both mean performance and robustness goals simultaneously. Graphical tools allow for the visualization and reporting of the multi-dimensional Design Space, within which a Control Space may be defined, verified and reported. All associated experimental, statistical, and prediction reports are available for collation into a single report to support and defend decision making with sound experimental and statistical evidence. This may be electronically signed and/or exported to various file types as your needs require. The image below is an example of a final Control Space definition set within the Robust Design Space. Moving the cursor within the design space renders a predictive chromatogram for those conditions. 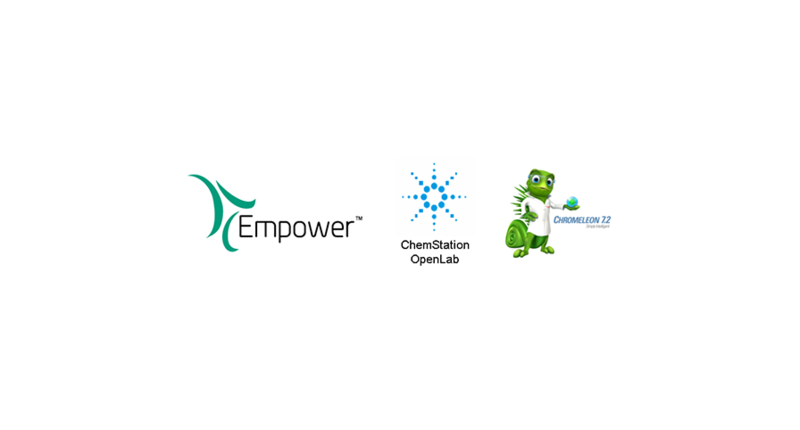 All these tools exist in a fully audited, user access controlled, 21 CFR Part 11 compliant networked platform. 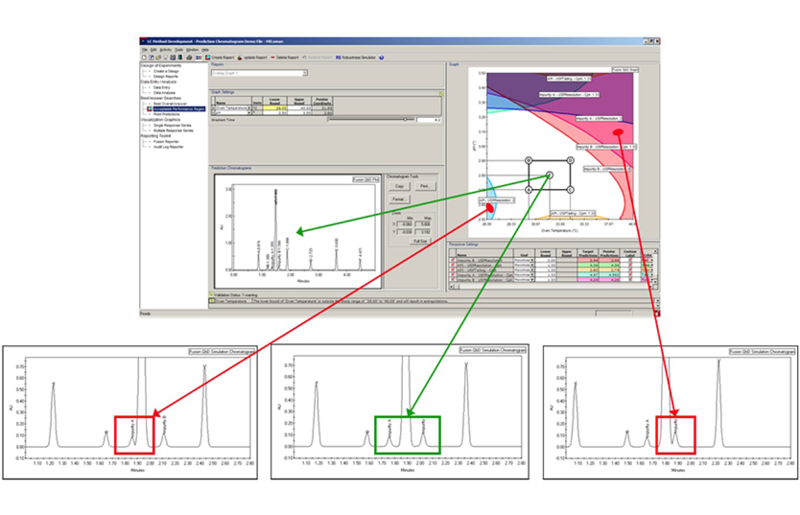 This makes Fusion QbD the perfect HPLC method development software, fit for purpose in today’s method development laboratory. For a brochure please click here. You will be asked to provide contact details so that we might get in touch, have a chat and discuss your needs. There will be no hard sell and your details will not be passed on to any other organization. Nor will you be bombarded with emails of little interest, that’s just not the way we work.